We are delighted that the work of one of our team has been the subject of a large article in our local newspaper, the Yorkshire Evening Post. Feature writer Neil Hudson contacted us in connection with a feature he was preparing about Christmas. 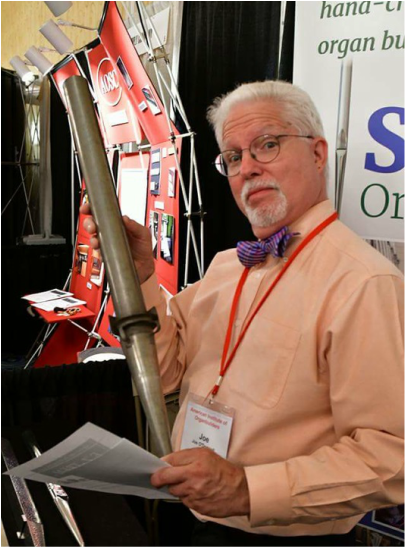 But when he met our senior pipe maker, John Warr, he decided to take a deeper look at our work. I’m so proud of the heritage and how Terry has now taken it a step further. The business they have now is unique. In some ways, it hasn’t changed at all, in that we still do everything by hand. ​"We don’t use power tools. But the working environment is a lot better: the lighting for a start, I used to work by a 60-watt bulb and I was working 44-hour week, that was basic, then there was overtime on top, we used to finish at seven at night and work Saturday mornings. “When I started, there were people working who had fought in the First World War and some of them were following in their father’s footsteps, so they went back to the 1800s. 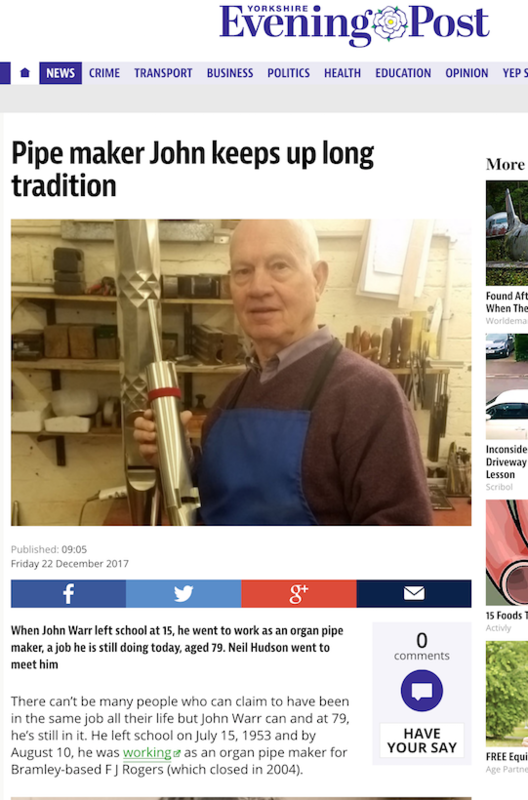 John Warr, above, in the Shires Organ Pipes workshop in Leeds, and a shot of the page from the Yorkshire Post, below. But even his long service is possibly not the most startling thing about a business which has assiduously avoided the trappings of modernisation. Walk through the workshop at Shires and nary a power tool will you see - everything here is done by hand, in time honoured tradition. While the temptation in previous years might have been to modernise, perhaps by introducing machines and technology, the fact Shires chose to walk a different path, one which pays homage to hard-won skills learned in a bygone age, is now the very thing which marks them as unique. Bearing in mind they make organ pipes for some of the most prestigious buildings in the world, including the OBE Chapel organ in St Paul’s Cathedral, replacing 3,500 pipes in Manchester Cathedral and others across the world including in America, Australia and New Zealand, it’s astonishing they have stuck so rigidly to tradition. In fact, conditions in the workshop are pretty much as they would have been 50 or even 100 years ago. 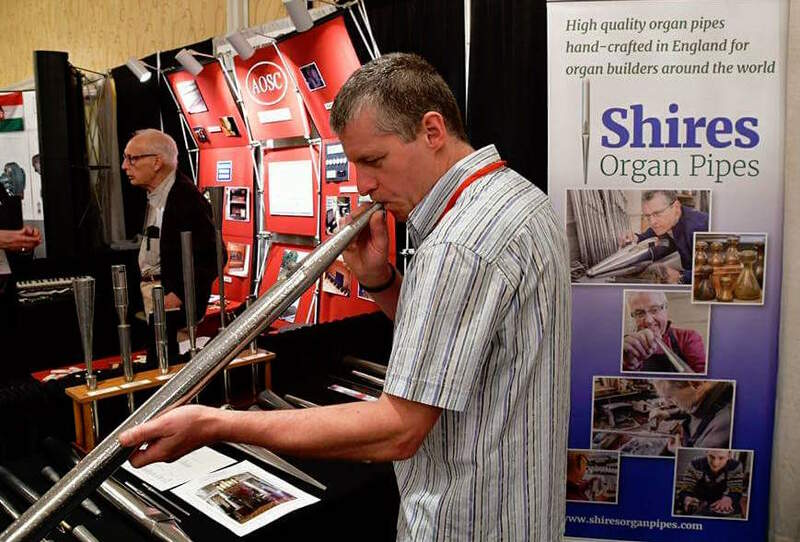 When it comes to making organ pipes, however, that’s no bad thing, as owner Terry Shires explains. Terry, whose son Chris, 22, started working for the company four years ago, was rapturous about John still working in the business. “To me, he’s invaluable,” said the 58-year-old. “At the moment, we’ve got the best crew we’ve ever had. Everyone knows what they’re doing, the quality of skill is unbelievable and that’s borne out by the fact that when cathedrals and universities throughout the world want a new organ or one repairing, invariably they come to us. 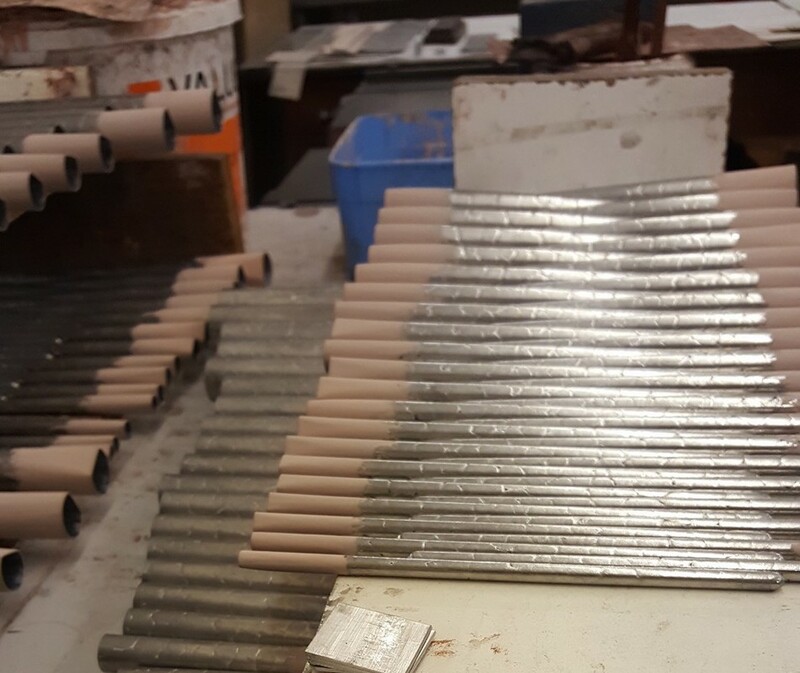 Occasionally we take pride in cutting corners at Shires Organ Pipes – but only when we are creating mitres. This tricky technique requires the pipes to be made to their full length and then sawn to the correct dimension in a mitre block. 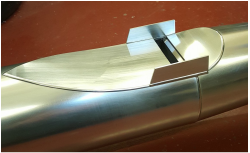 The angled pieces are then in turn tacked and soldered by hand, a process which requires patience, precision and no little dexterity. 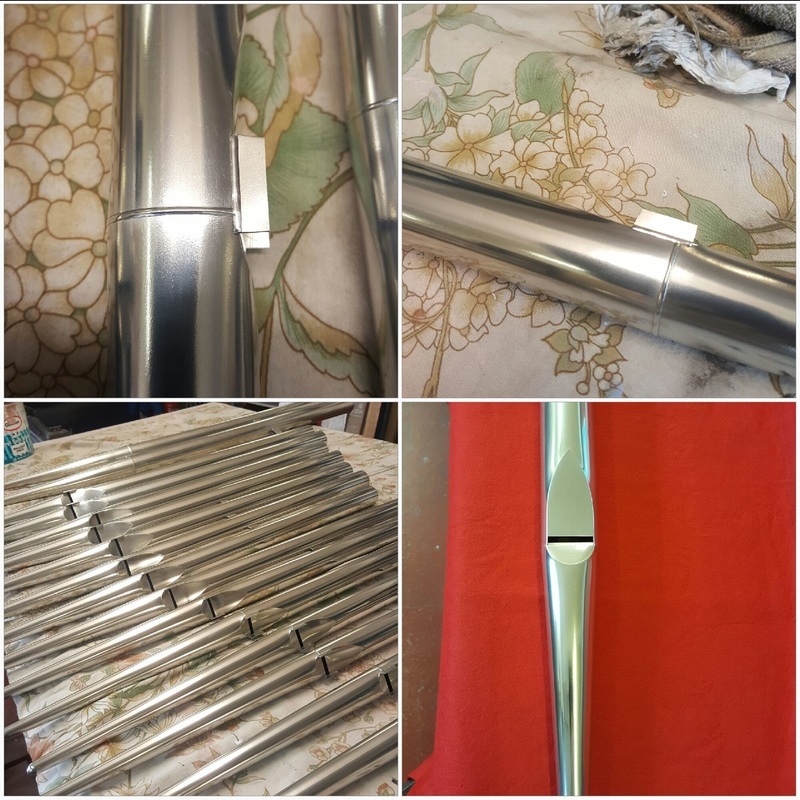 The rank of pedal pipes was made and mitred in our workshop by Terry Doyle for a British organ builder and is destined for a church in Australia. 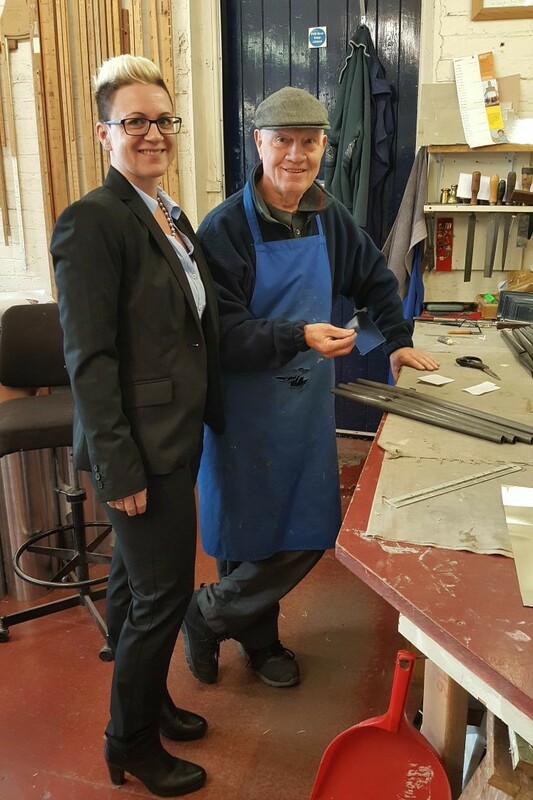 Stefanie with our senior pipe maker John Warr. It was good to discuss different methods and techniques of pipemaking and to show her our standard of work. It was also interesting to hear that our workshop was similar to theirs in the way they manufacture pipes. All the Shires team enjoyed meeting her and I think we all benefited from discussing our companies. 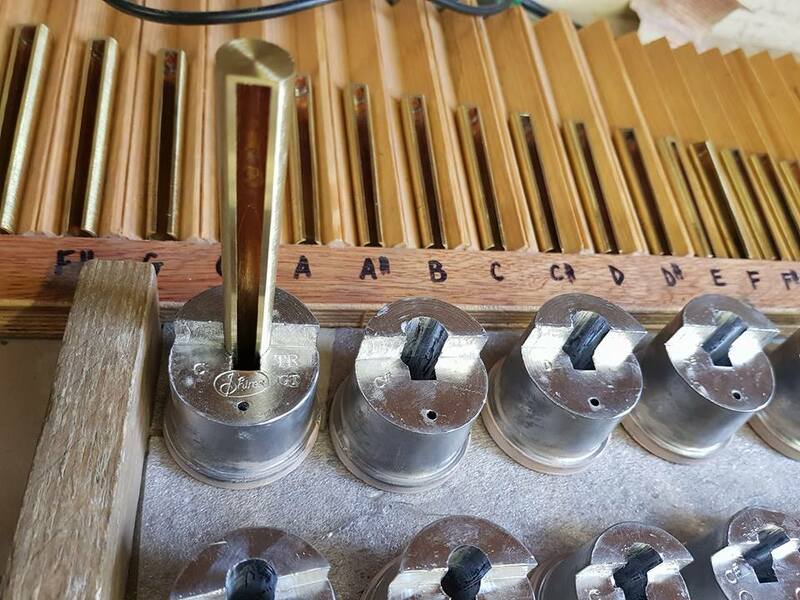 ​Work at Shires is progressing well with the reeds for a new organ by William Drake Ltd destined for Chelsea Old Church in London. The three-manual organ will have 33 speaking stops. This will be Drake’s first new organ to combine classical principles with Victorian innovations: the inclusion of string stops, a manual Bourdon and an 1850s Hill-style pedal trombone. 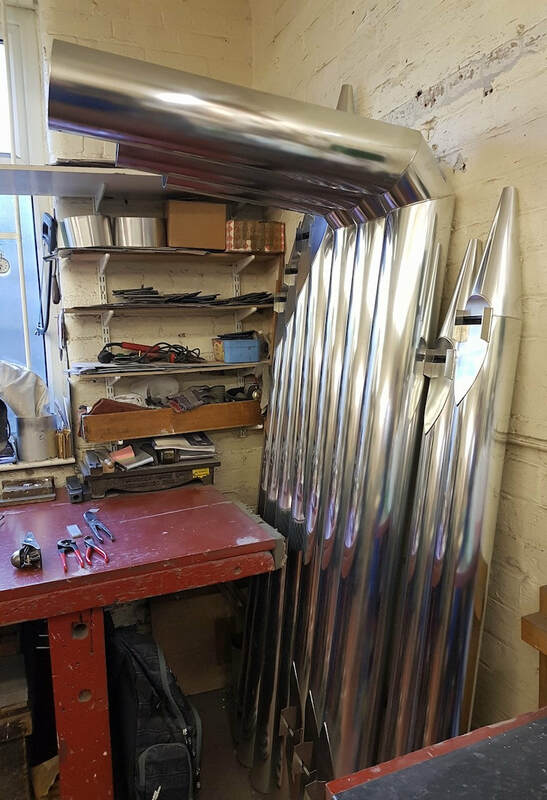 ​We are delighted to have been asked to make all of the metal pipes for this organ. It may look easy – until you try it! 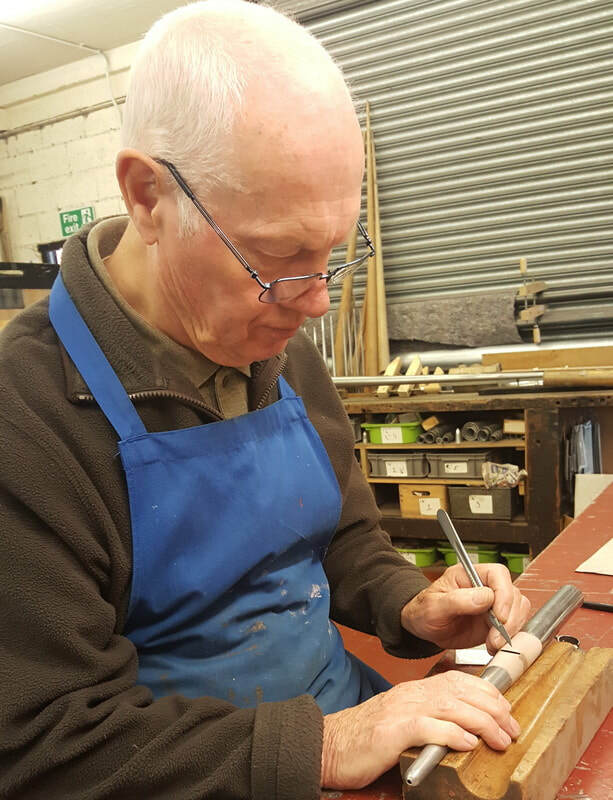 Here is Steve Parker carrying out a traditional organ pipe-making technique: planing the metal by hand. ​He's been doing it for a good few years, so he's pretty handy at it. 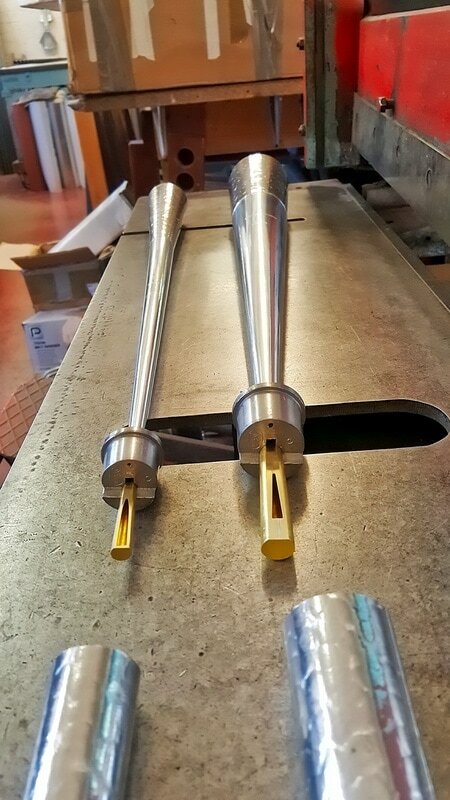 Steve knows how to remove just the right amount of metal from the tops to allow for cone or scroll tuning..
​And it's all done by skill, touch and experience. 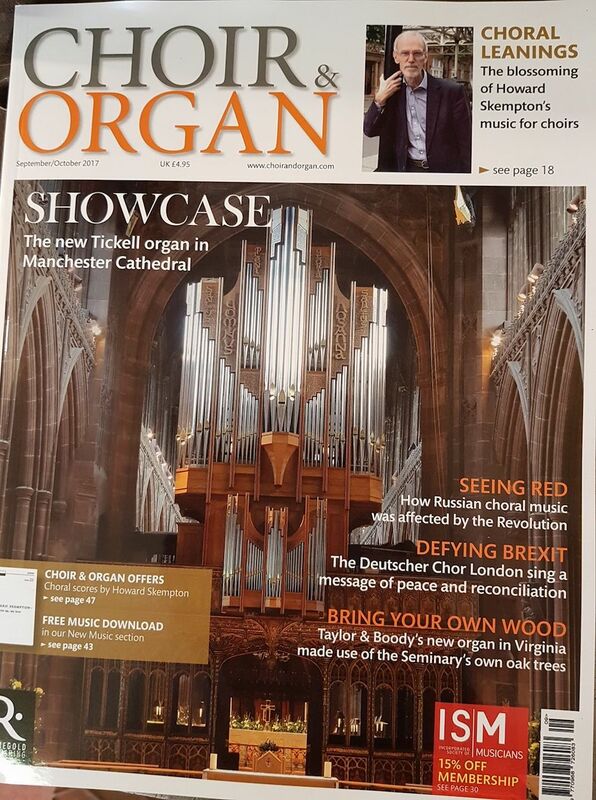 Everyone at Shires is pleased to see that our work has made the front cover of﻿ ﻿Choir and Organ﻿ magazine﻿. 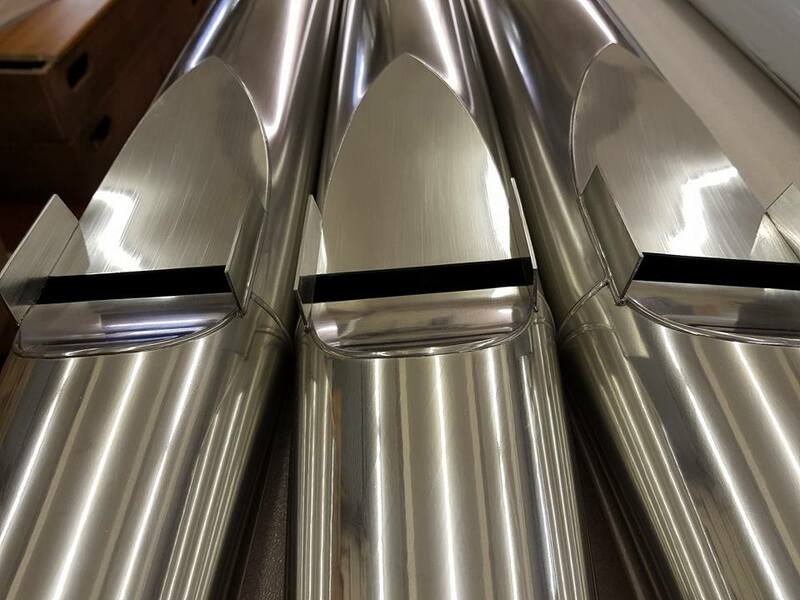 We were delighted to make all of the metal flue pipes, including the fronts, for the new four-manual Tickell organ in Manchester Cathedral. The dedication and blessing of the instrument will be followed by a concert by the renowned concert organist, Thomas Trotter on Thursday, September 14 at 7.15pm. 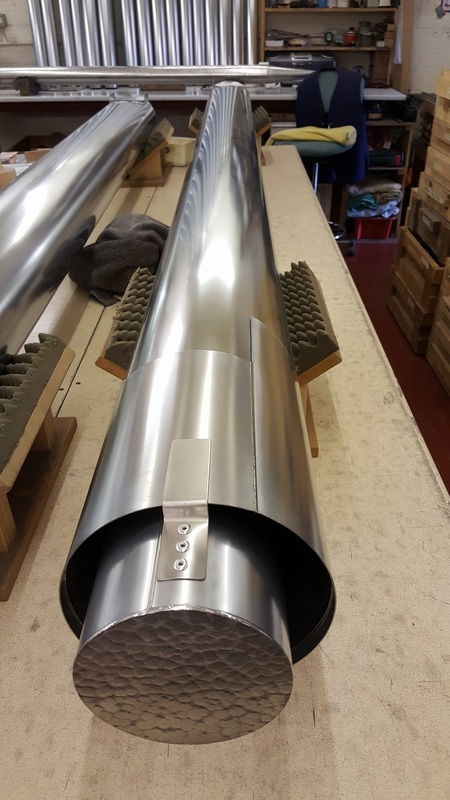 How do we prepare completed organ pipes for delivery, such as this 8' Open Diapason in 80 per cent tin destined for America? in a self-adhesive coating, as demonstrated in the video, above. 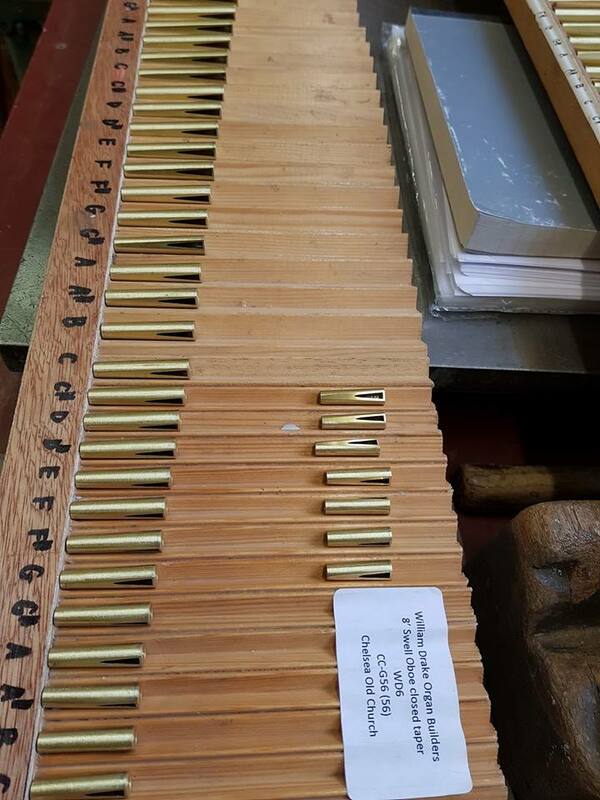 We were approached recently by a reed voicer in America who asked if we could supply him with some sample reeds. We were happy to accept the invitation and sent him the Oboe and French Horn pipes, above. Their production was a joint effort by Terry Shires and Terry Doyle and the pipes are made from spotted metal and zinc with brass wedges. Our American friend was clearly delighted, for he wrote to us praising the 'absolutely gorgeous work' and saying that he hoped to order from us soon. We are delighted to say that an order has now been placed with us for an 8ft Trumpet, with a Tuba to follow. 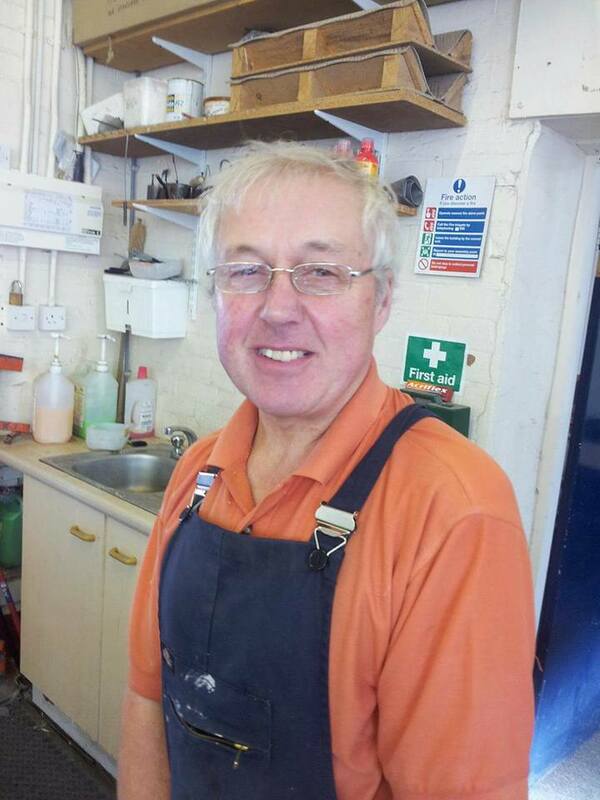 George Harry Fowler, our workshop foreman, celebrated his 70th birthday on June 14. 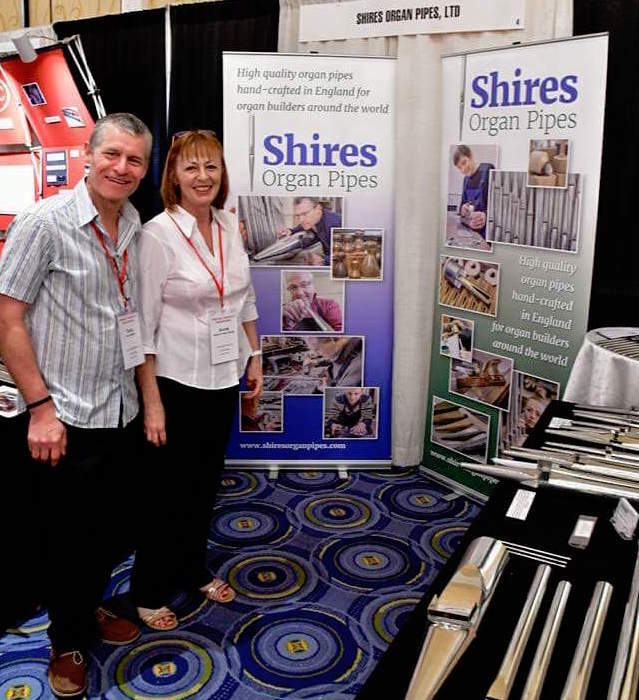 Terry Shires writes: "In 1962 aged 15, George started pipe making for F J Rogers of Bramley, Leeds. I started my career there and met George in June 1975. "I was determined to become a good pipemaker and was told by the other men to try and become as good a craftsmen as George. He was the best pipemaker by far. "Simply put, the man is a legend and our lads are in awe of him. He still turns out fantastic pipes day in, day out and he has a wonderful attitude to his work and life! "There's not much that George can't do, but he specialises in mixtures and has probably made more than any other pipe maker. He is also a master at restoration, as a glimpse at these pictures will testify. Shires Organ Pipes wouldn't be what it is today without the work and help given by George and I will always be grateful to him for this. So, congratulations George and thank you so much." 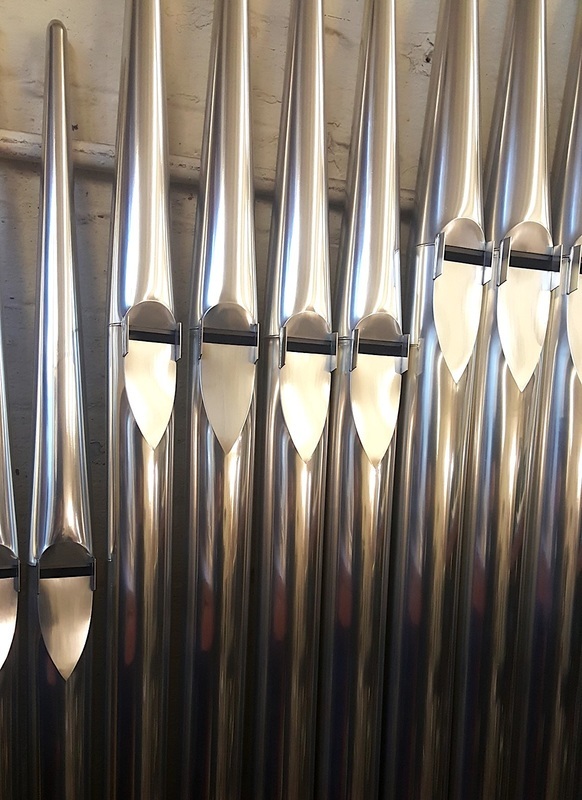 ​William Drake Ltd is to build a new organ for Chelsea Old Church in London – and the team at Shires Organ Pipes is delighted to have been chosen to make the pipes. 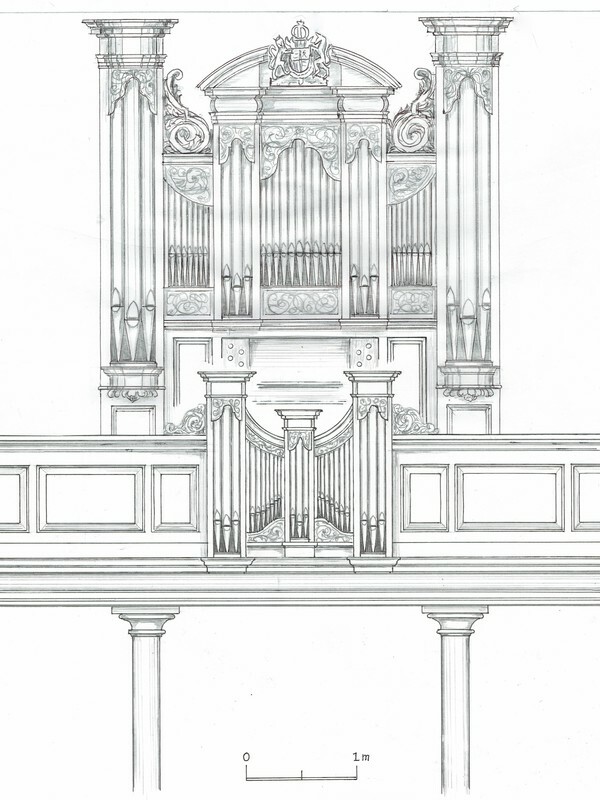 The organ will have 33 speaking stops divided over three manuals and pedals and the case design draws on English organs from the early 18th century. It will be William Drake’s first new organ to combine classical principles with Victorian innovations: the inclusion of string stops, a manual Bourdon and an 1850s Hill-style pedal trombone. The project is due to be completed in January 2019. 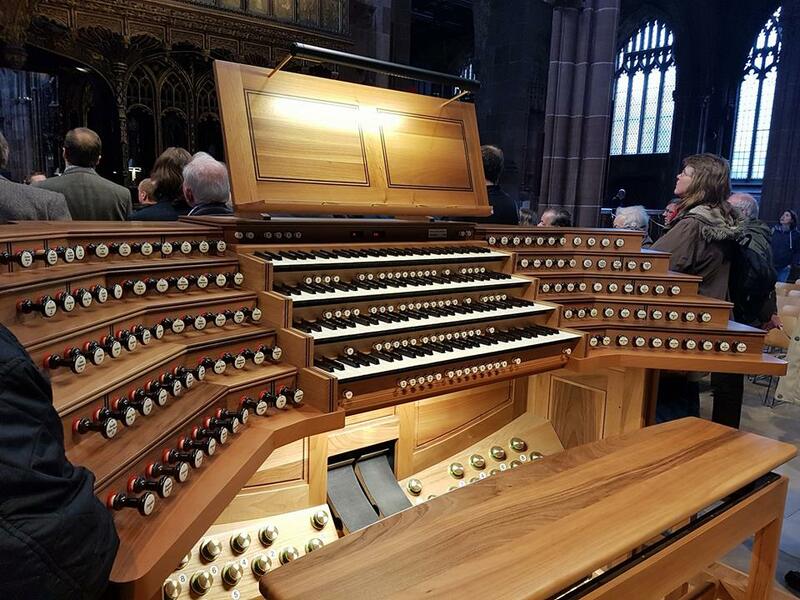 The new 79-stop Kenneth Tickell, organ in Manchester Cathedral was used for the first time on Easter Sunday, 2017. 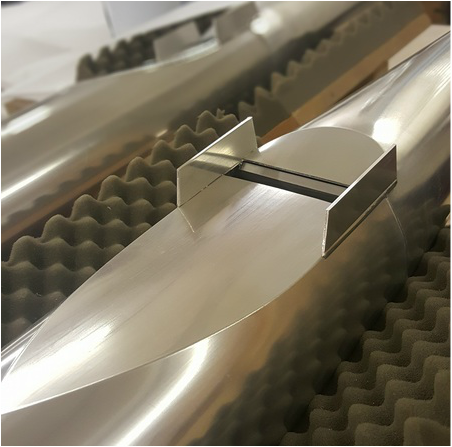 Our firm was were delighted to make all of the metal flue pipes for this important, four-manual, mechanical-action instrument. 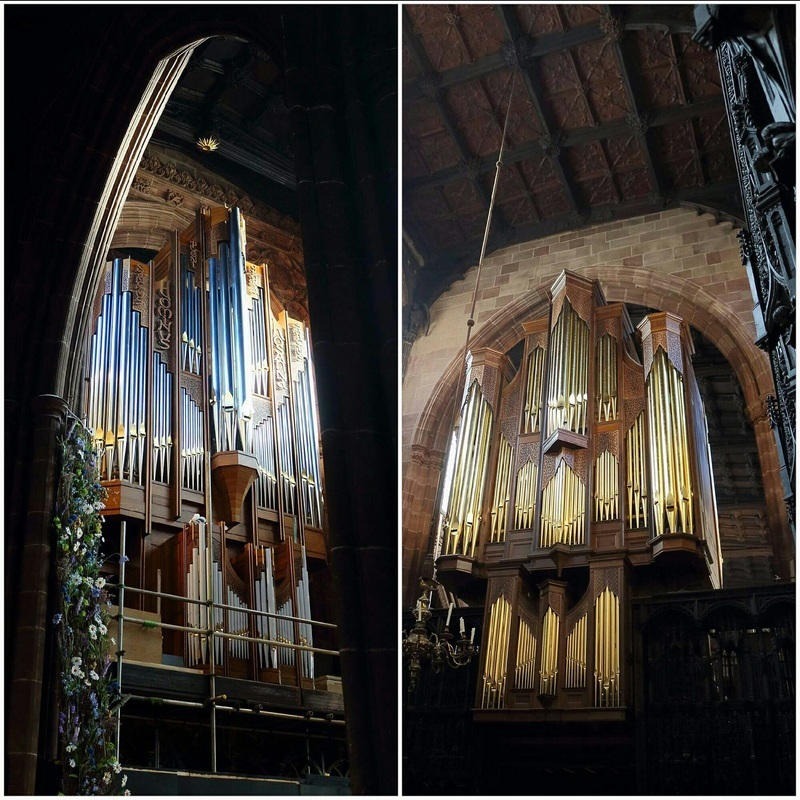 The old organ was badly damaged when a bomb exploded on the north east side of the Cathedral in 1940 and stop-gap measures were taken to repair the instrument, re-using old pipework. 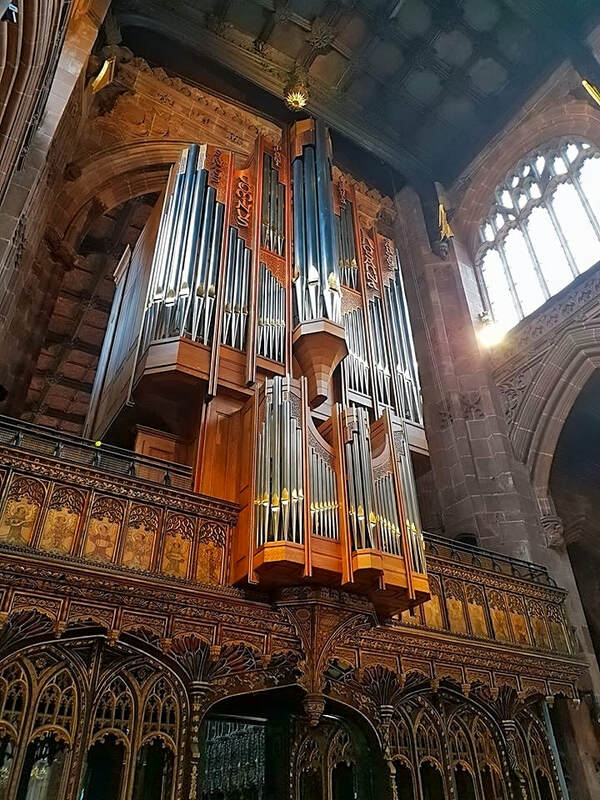 In 2010, the Bishop of Manchester launched a fundraising appeal for a new organ in Manchester Cathedral. The previous organ took up space in the aisles, but its replacement is mounted on the screen, as were the pre-war organs. ​A new organ for the Song School in Westminster Abbey was officially opened on March 16. 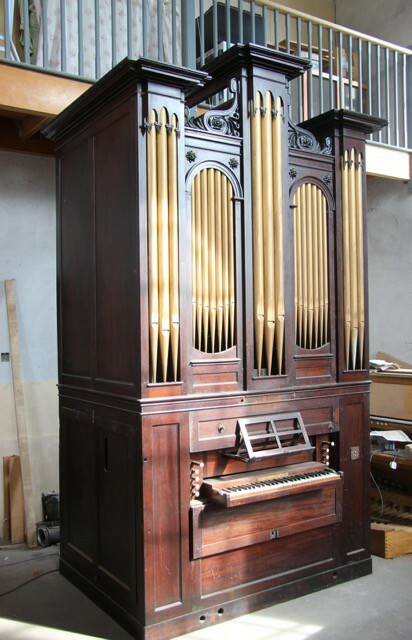 This exciting instrument was designed and made by the Devon-based organ builders, William Drake. Their challenge was "to design an instrument that elegantly met the specification within the constraints of the setting, but with the necessary musical resources for its envisaged use." Shires was delighted to manufacture all of the metal pipes used in this project. 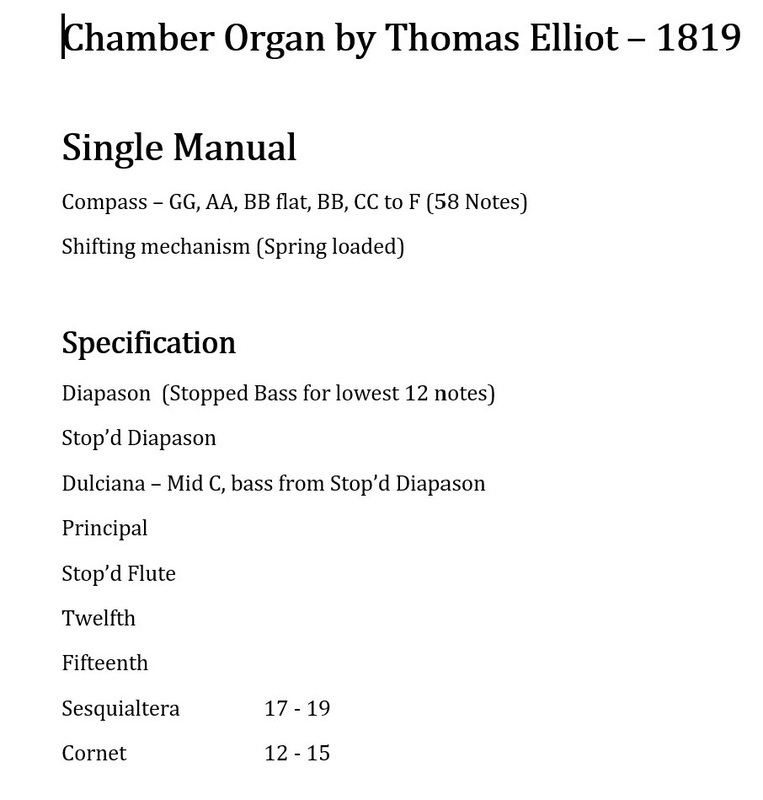 Manual II: Stop Diapason 8, Flute 4, Twelfth 2 2/3, Fifteenth 2. ​We were pleased to receive a visit this week from Nick Moore, above left, who is studying sound engineering and production at Birmingham City University. 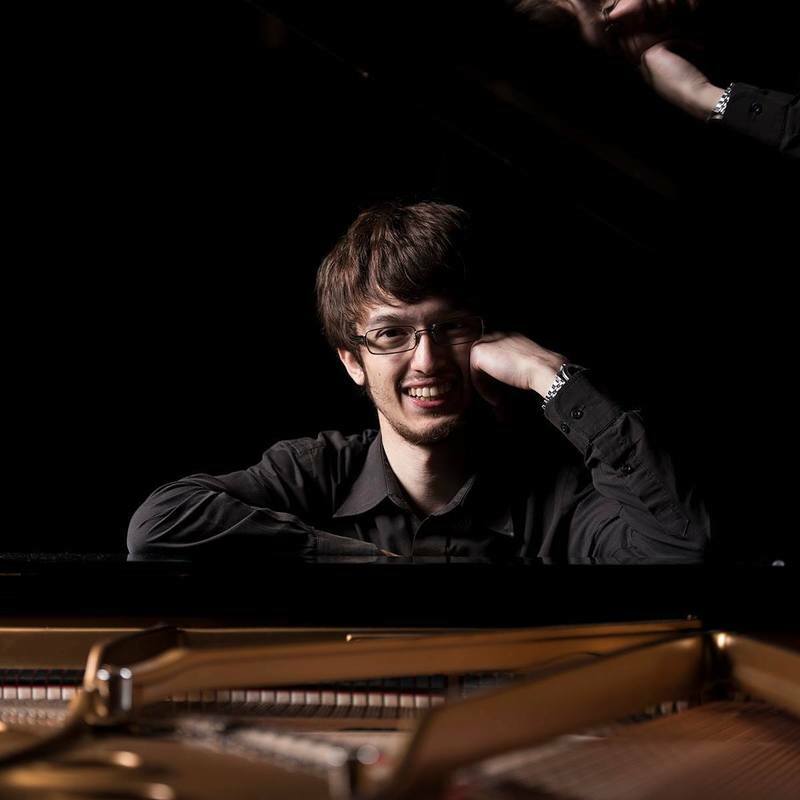 Besides being a pianist and organist, Nick's gift for photography is amply demonstrated by the slideshow images, above right. We’re grateful to him for sharing these fine shots, taken in our workshop in Leeds. When an American organ music enthusiast decided to give an inscribed pipe to the young Dutch organist Gert van Hoef, left, he approached Shires to do the work. 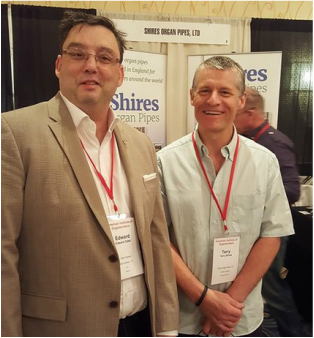 Terry Shires was delighted to create this presentation pipe, in 80 per cent tin, for Jeff DeCoe of Michigan. It was delivered yesterday to Gert, 22, in the Netherlands. 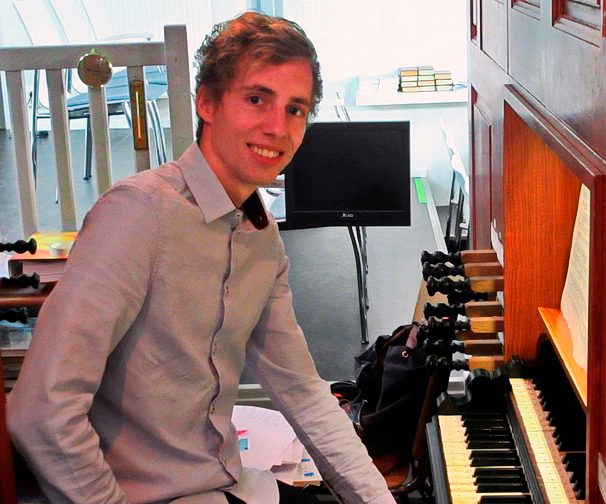 Gert's organ career began at 13 under his grandfather's tuition and he soon began posting performances on YouTube, bringing his talents to a worldwide audience. Although our workshop is based in Leeds, our company has an international outlook. 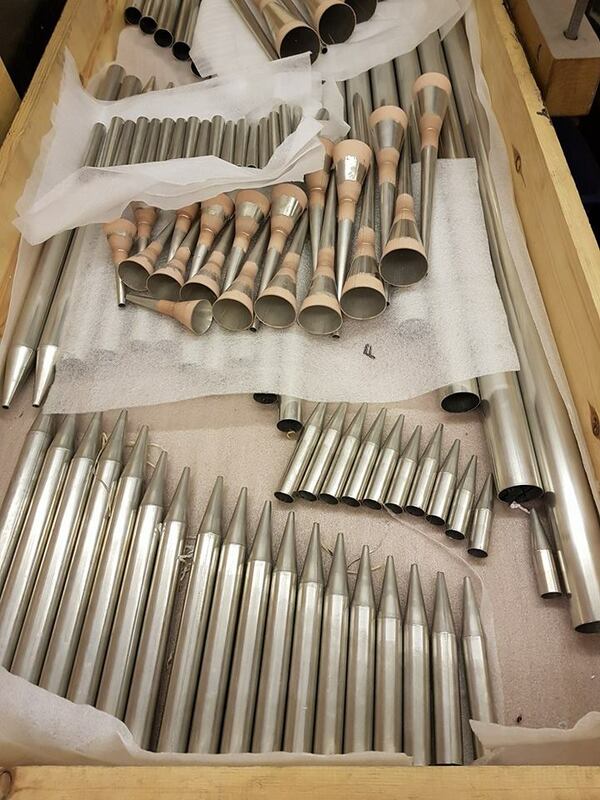 For example, the spotted metal pipes, above left, are part of a four-rank mixture that was made by George Fowler and is going to a new organ in Japan. 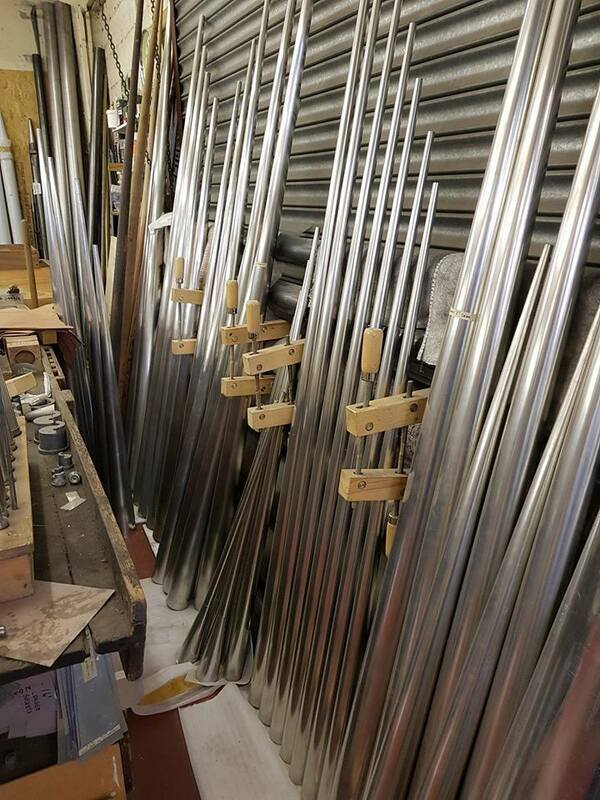 The display pipes, above right, are destined for David E Wallace & Co Pipe Organ builders in Maine, United States. 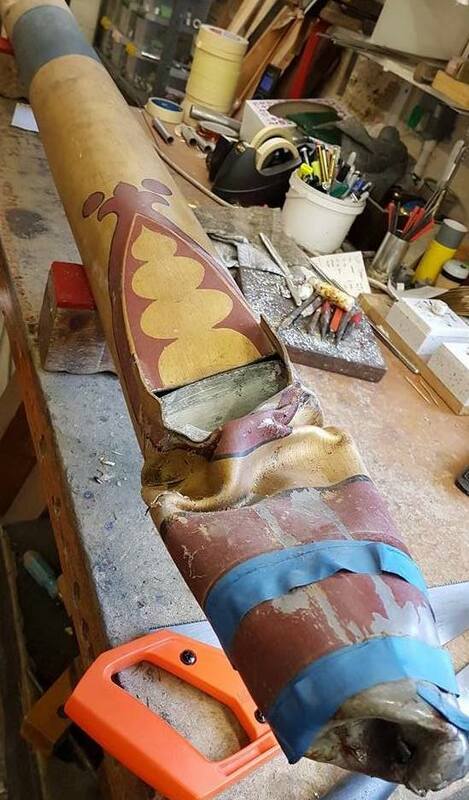 The project is for a church in Ontario, Canada. This is our first rank of pipes for David but we are hoping to work with him and his crew again on many other projects. In recent weeks we've also shipped pipes to China. The world is our lobster! 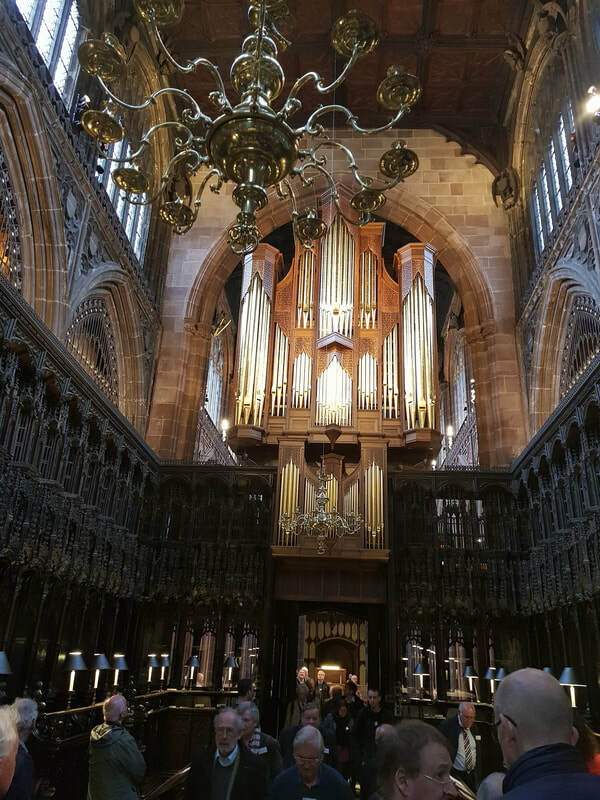 Here are the east and west cases of the new Tickell organ in Manchester Cathedral, in which we are proud to have played a part. The four-manual instrument of 79 stops is due to be ready early in 2017. The screen case contains the Great, Swell and Pedal, arranged to speak equally east and west. A Choir organ speaks east into the chancel and a west facing Positive. 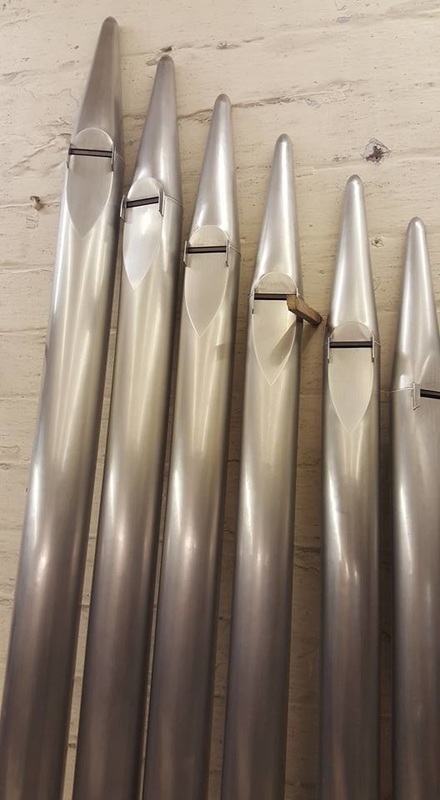 All of the metal pipework has been made in Leeds by Shires Organ Pipes. The organ in Fulneck Moravian Church, Pudsey, Leeds, was built and installed in 1748 by the Swiss-born John Snetzler. The stop above was installed during the rebuild by JJ Binns in 1929.
the front of the case with new pipes in tin, above right, made by Terry Doyle. We have also replaced the corks in the Binns pipes, above left, with felted cans. 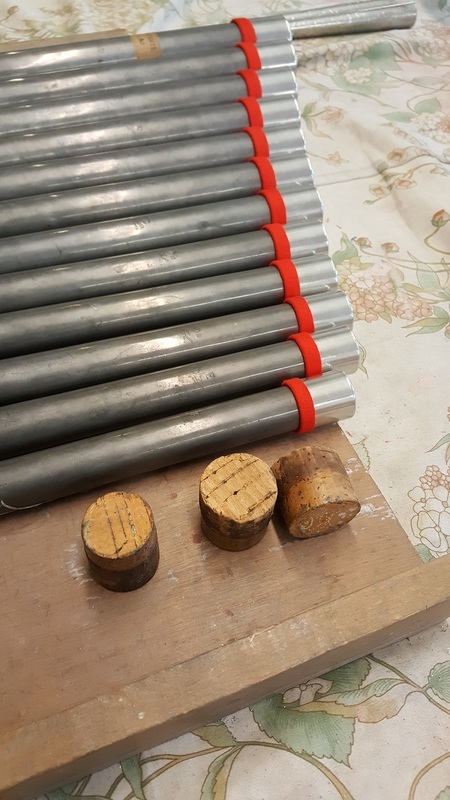 Corks are an unreliable tuning method and we are sure the new new cans, made in our Leeds workshop by Chris Shires, will serve the organ well for many years. We are delighted that the work on this important organ was recognised today by a feature in the Yorkshire Post. 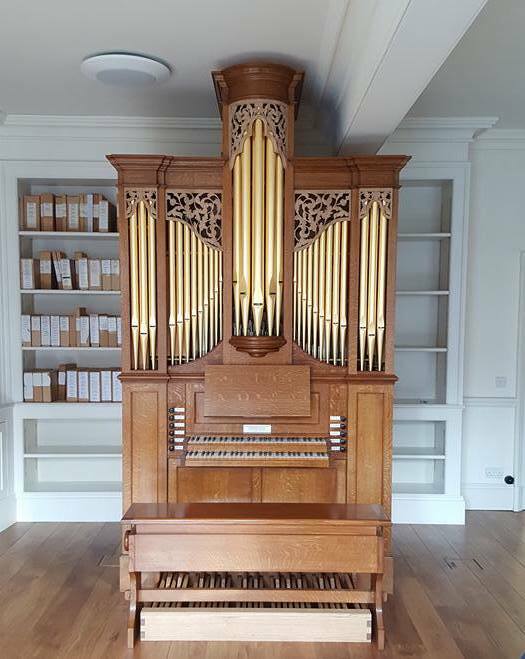 William Drake are restoring this 1819 chamber organ by Thomas Elliot and the team at Shires were pleased to be invited to lengthen all pipes to correct pitch and restore as necessary. Crushed and buckled pipes ... ... now perfectly restored. 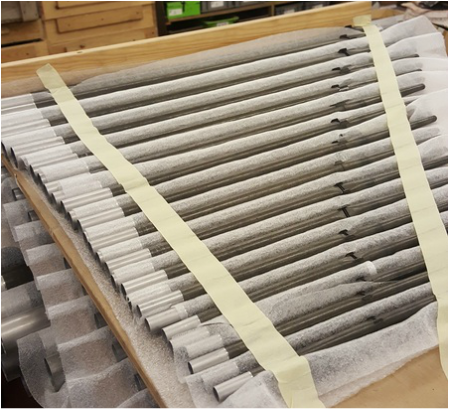 Shires is best known for making organ pipes, but we're often called on by organ builders to repair damaged ones. Damage can be severe, as shown by the buckled examples, left. But we rise to the challenge and, as the image on the right shows, the result can be a perfect restoration. 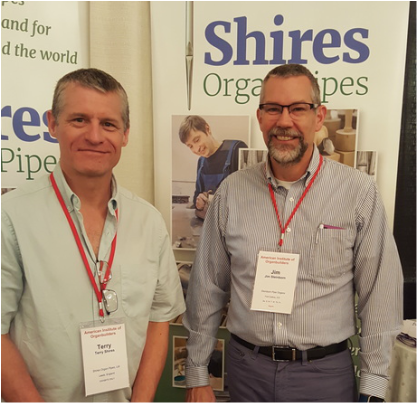 After their trip across the Atlantic, Terry and Annie Shires are settled in Boston and meeting visitors to the convention of the American Institute of Organbuilders. About 60 hand-made pipes from Shires were shipped to the United States two weeks ago. Among them is the 'Jester' pipe, above. 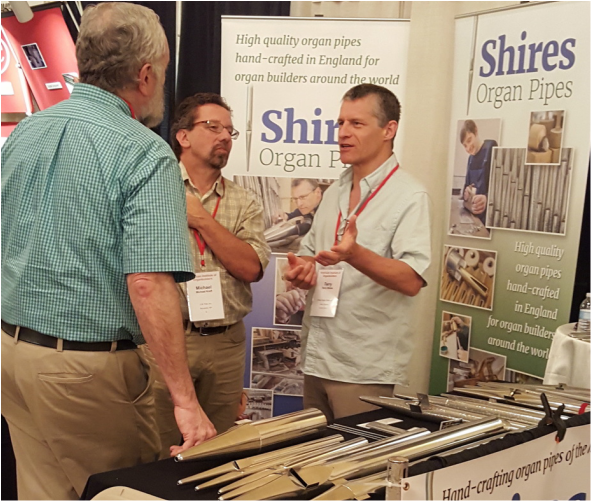 Among visitors to the stand has been the organ builder Edward Odell, whose Connecticut company has been building pipe organs for 150 years. Terry says: "I feel like I've known him for years. I was just about to hug him, but he threatened to hit me with a doppel pipe!" 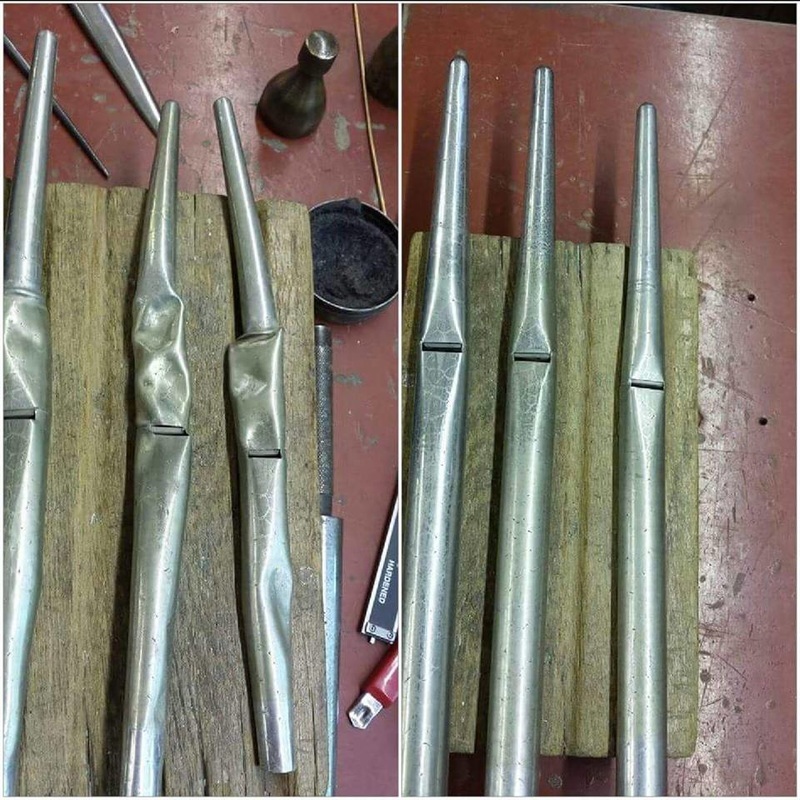 We are pleased to say that the Haskell pipes made in our workshop for Manchester Cathedral have been finished. They are the the Violone 16’, Gamba 8’ and Viole 16’ on the Great and the Geigen 8' and Salicional 8' on the Swell. A 'Haskell' is an open pipe with a stopped tube suspended inside it. Like the stopped pipe, it sounds an octave lower than a simple open pipe of the same length, but with the harmonic structure intact. The wires used to suspend the inner tube. Display boards ready for the AIO convention in Boston. 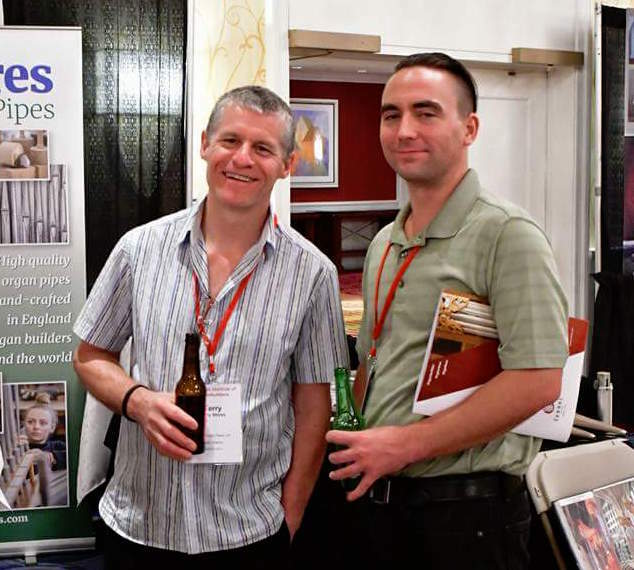 A determination to increase our international presence takes our firm to an exhibition in America. 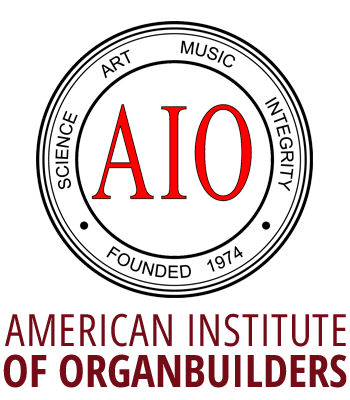 Terry and Annie Shires will represent the company at the annual convention of the American Institute of Organbuilders in Boston. Terry says: “We have been thinking about getting more into the American market and thought this was a good place to start. We have hired a stand and will be there for four days as exhibitors. “We are taking a really good selection of reed and flue work that includes the original sample pipes that we made for Spitalfields. We will also have on display three types of French Horn pipes for Willis, Harrison and Harrison and Spitalfields. 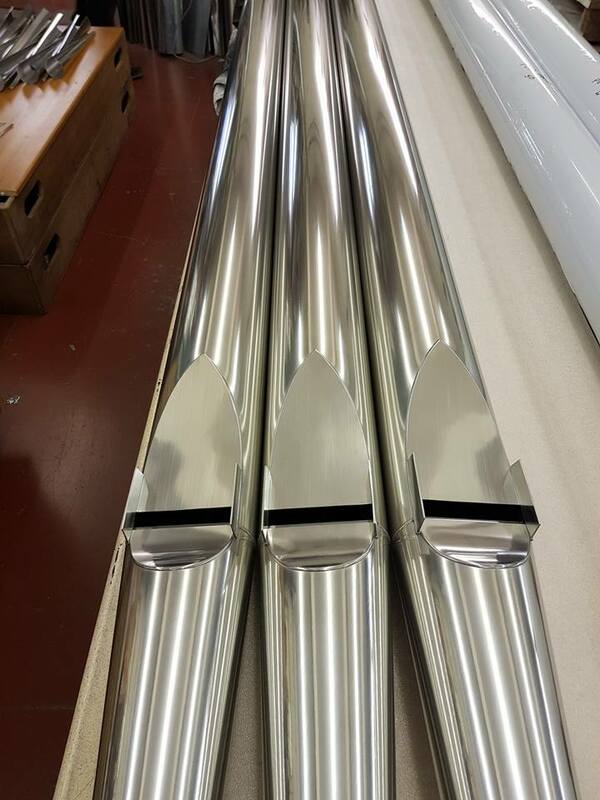 As previously reported, we've been privileged to be entrusted with making metal flues for the new Kenneth Tickell organ in Manchester Cathedral. 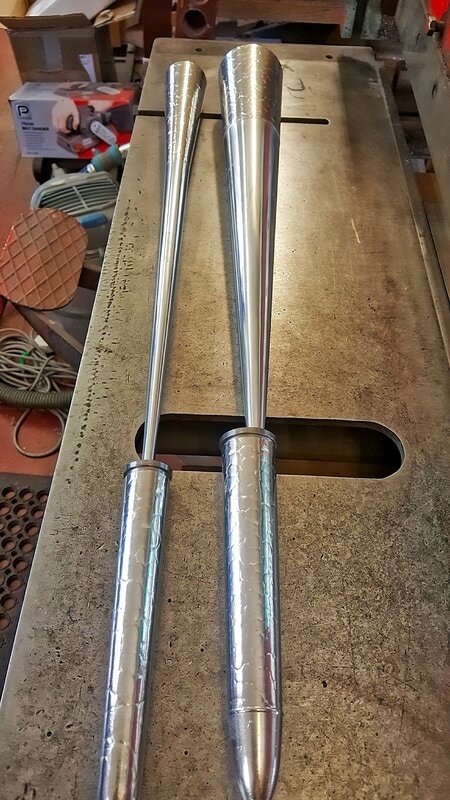 A milestone was reached when the last of the front pipes, left, were dispatched from our workshop. Terry Shires says: "I made these myself and feel privileged to have been involved in this work. I'm really looking forward to seeing and hearing the organ before too long." 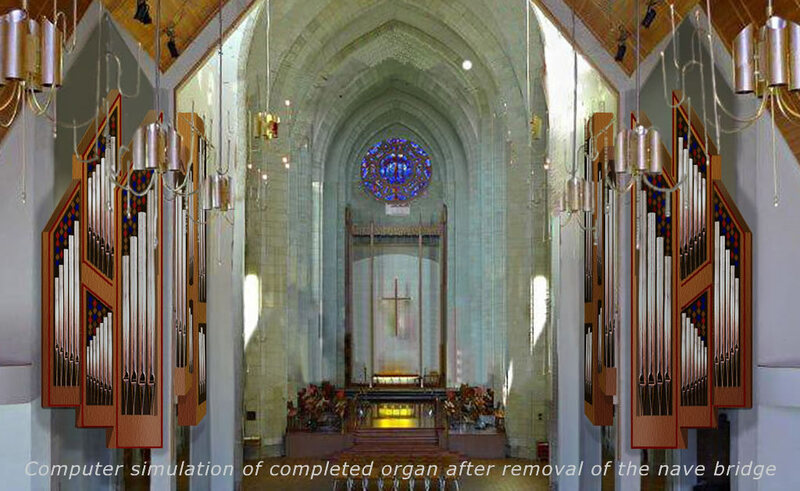 The new organ has been designed with better access for tuning and maintenance. It will use mechanical key action and incorporate a projecting Positive division to the west and a similarly-positioned Choir department to the east. ​These shining examples of the pipe maker's craft were made in our workshop by Terry Doyle. 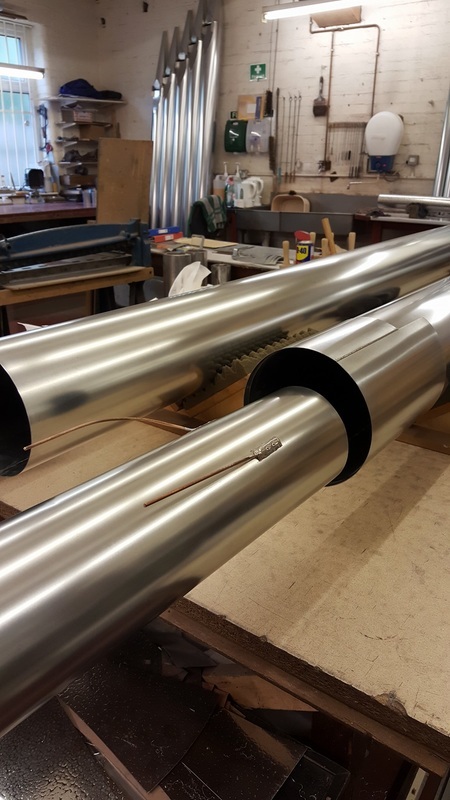 They form part of the west end display pipes for the new organ being installed in Manchester Cathedral by Kenneth Tickell and company of Northampton. 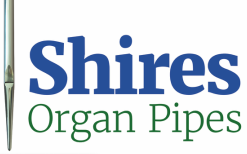 The work of Shires Pipe Organs has been featured in one of England's most respected regional morning newspapers, The Yorkshire Post. The Leeds-based paper had been alerted to our work after freelance photographer, Giles Rocholl, a former YP staffer, had posted some pictures on Facebook. 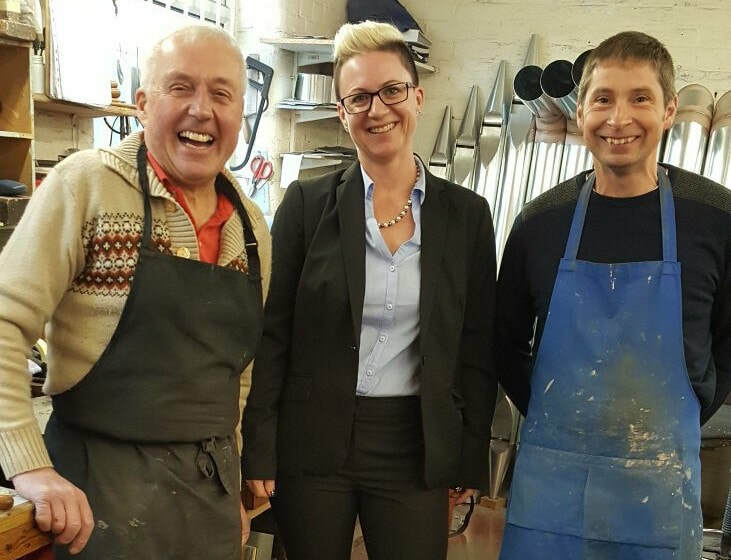 We'd commissioned him to take them for our new website and he spent a morning at our workshop a few weeks ago. He's a superb photographer and we were delighted with the results. 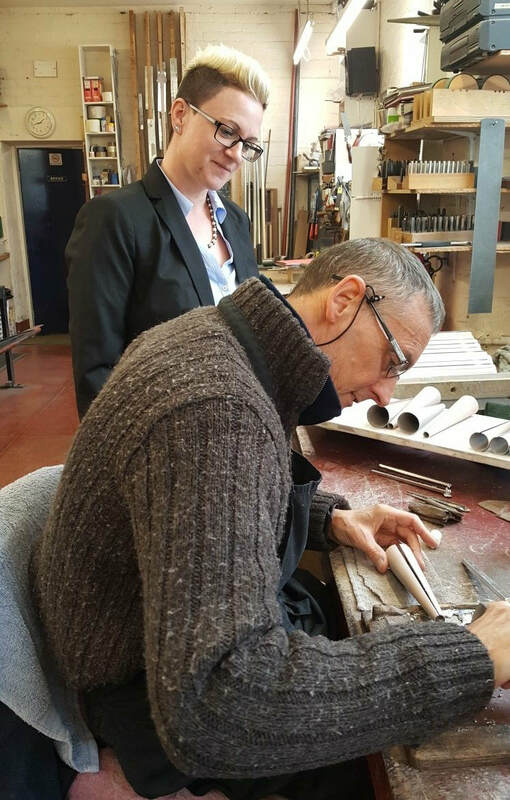 YP features editor Sarah Freeman came to our workshop to learn the mysteries of pipe-making and to interview members of our team for the feature which appeared in the Post's colour magazine on June 11, with pictures by Tony Johnson. 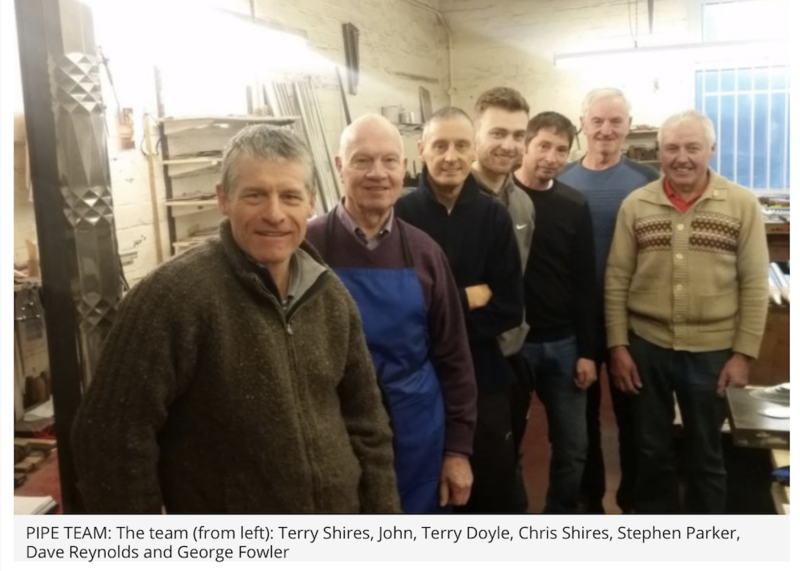 We were all very pleased with the results and by the encouraging amount of feedback – so we can forgive the captions for referring to the company's founder as 'Terry Shire'! Click on the picture, left, for a link to the full article. 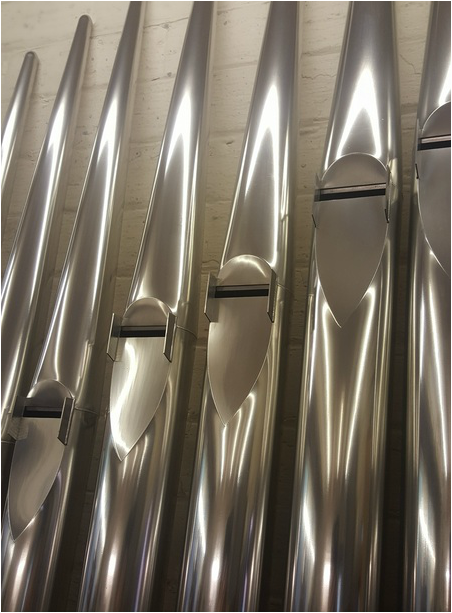 Shires Organ Pipes was privileged to be entrusted with making the metal pipes for the new organ by Kenneth Tickell in Manchester Cathedral. The four-manual, 79-stop instrument is due to be completed next year. On the left is one of the open diapason 8' east side display pipes, made by Terry Doyle. The neatness and precision of the work shows how well he can solder in upper and lower lips. 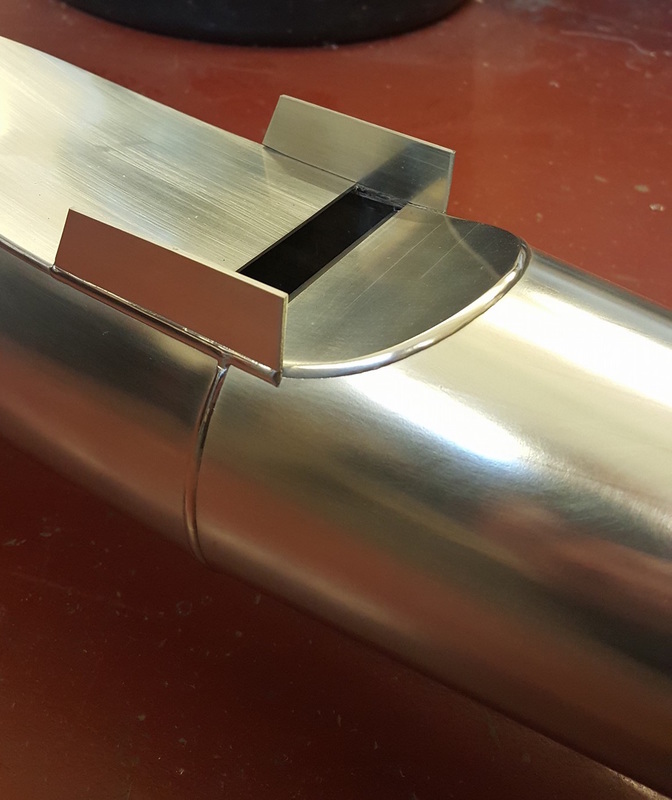 A pipe made of 80 per cent tin is difficult to solder, as its melting point is close to that of the solder itself, so to achieve this standard shows great skill and patience. 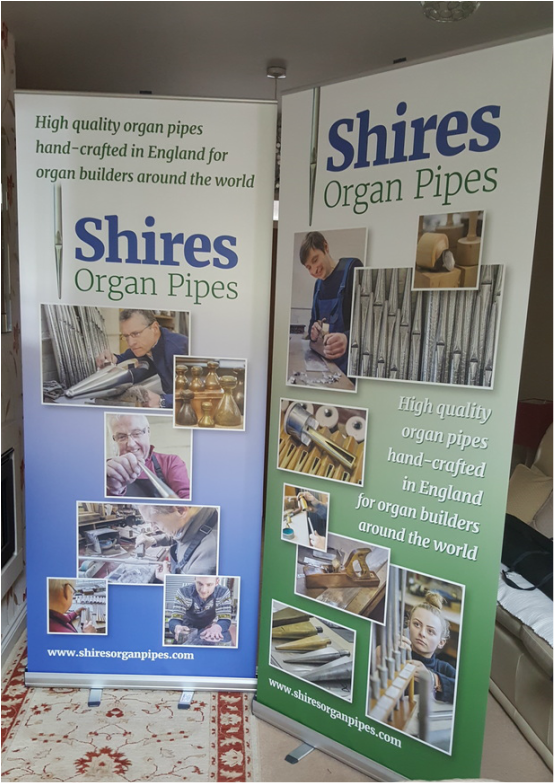 Shires Organ Pipes was pleased to be invited to supply pipes for the two-manual, seven stop instrument, work on which is now in progress. 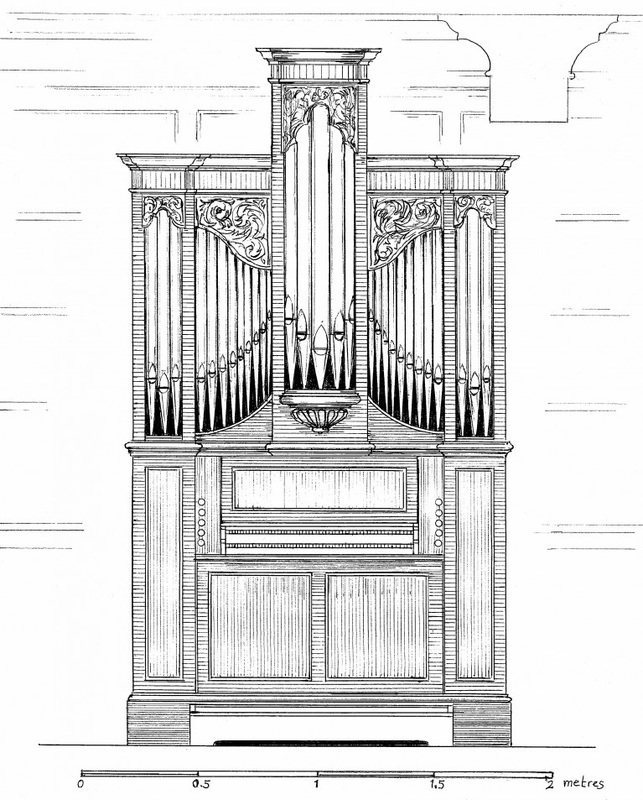 A drawing of the organ can be seen, left, with some of the pipes, far left, made by the Shires team. Our organ pipes travel a long way – but few as far as New Zealand where some of them will be heard in Holy Trinity Cathedral, Auckland. 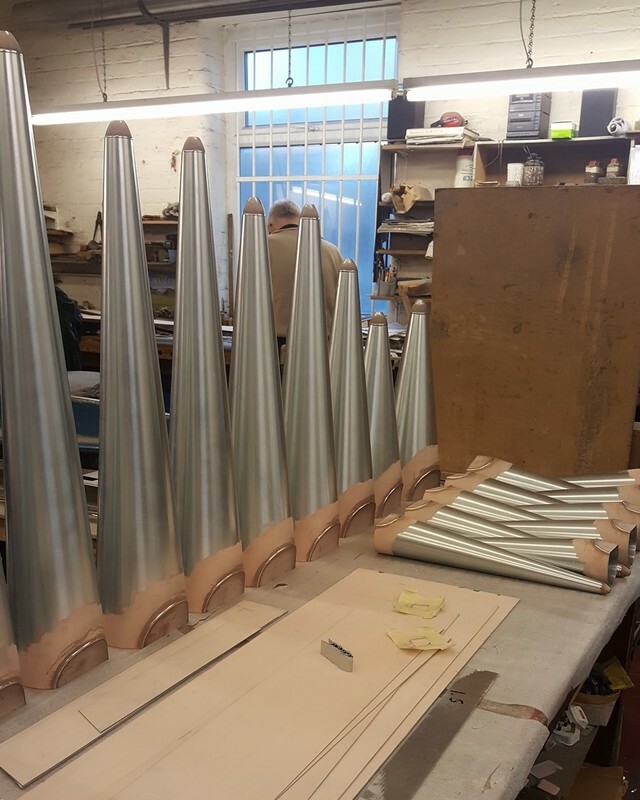 A new four-manual instrument is being built by the British firm, Nicholson of Malvern, and we're delighted that 18 of the stops have been commissioned from Shires Organ Pipes. This will be the largest cathedral organ from an English builder since 1926 and will be completed next year. A simulation of the proposed casework can be seen, right.